The Pedigree Dentastix Large Dog Treat are a chew-tastic mouth crunching delicious treat which helps reduce the build-up of tartar making these doubly good. 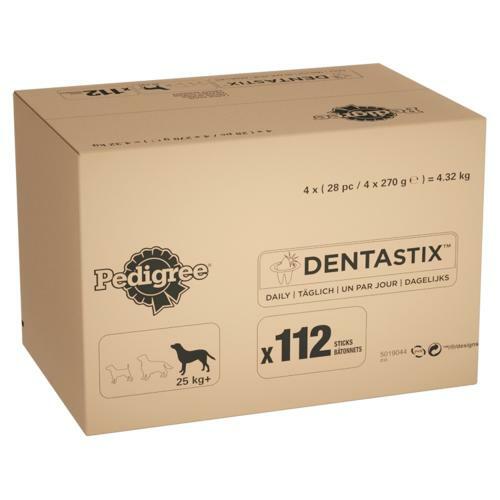 Recommended by Vets the Pedigree Dentastix helps reduce the build-up of tartar by approximately 80% when eaten daily, improving the oral hygiene of your dog. Commonly disregarded as a minor health concern for dogs it has been shown that 4 out of 5 dogs suffer from gum disease which not only causes bad breath but you may notice that your dog might become reluctant to chew, making it important to help promote good oral health, the Dentastix are a simple way to build long term habits. Active ingredients: Pedigree DentaStix contain two very special active ingredients (sodium tripolyphosphate and zinc sulphate), which bond with the calcium in saliva and slow down the build-up of tartar. This helps plaque stays softer for longer and makes it easier to remove by chewing Pedigree DentaStix.